Ferryview Park, a unique student accommodation complex situated in a completely unrivalled location in terms of accessibility to the National Maritime College, which is only half a mile away. The complex is also close to frequent bus routes to Cork City. This exciting development, the first and only of it’s kind in Ringaskiddy and the National Maritime College, provides a convenient and secure environment for students. 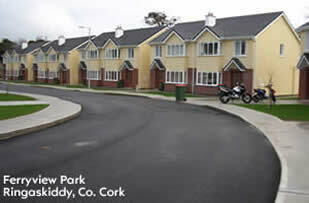 Ferryview Park is a completely open-plan campus consisting of quality purpose built student accommodation houses. Fully fitted kitchen with cooker/hob/extractor, washer/dryer, microwave, dishwasher and all other mod cons. * Security Deposit is refundable upon final inspection of house. 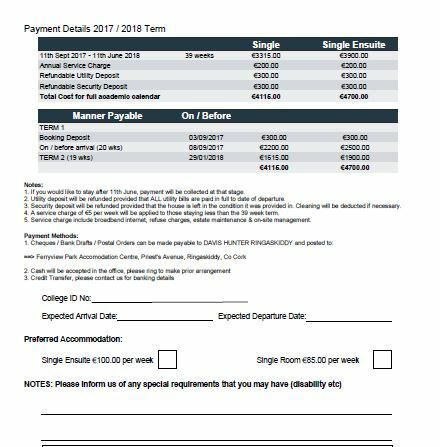 ** Utility charges such as gas and ESB will be automatically deducted from Utility deposit and balance will be refunded at end of college year. *** Annual Service charge includes refuse, water and broadband etc. All rental must be paid up front on a term-by-term basis.